Shelby Alexander is an aging ex-boxer and retired fixer, whose activities often flirted with the wrong side of the law. Looking for a little peace and a slower pace of life, he moved to Serenity, the small Michigan town where he grew up. But trouble follows men like Shelby, and he finds himself embroiled in an underworld of drugs and violence that may prove to be his undoing. The first book in the new Shelby Alexander Thriller Series, Serenity is an action-packed read with a lovingly rendered cast, witty dialogue, and a main character who doesn't know when to quit. Serenity immediately grabbed my attention right from its first chapter -- a woman died in Shelby's arms. It may involve drugs, an infamous family, and a war between drug dealers. OR it could have just been an accident. But then Shelby was asked and paid to find things out. It had an intriguing start and I also like how it really just holds my attention. It's thrilling. I always have that desire to just know what happens next, and what really is the deal, and who the heck killed Jenny -- that innocent Jenny. Shelby has been divorced to his wife for years. His daughter grew apart from him but they were able to connect recently. She keeps on pestering him on talking to her mother and I really like how Craig A. Hart just deals with this family issue so well. Okay, it's exactly highlighted in the novel but I like that her daughter is always concerned of him (and OMG that ending!). 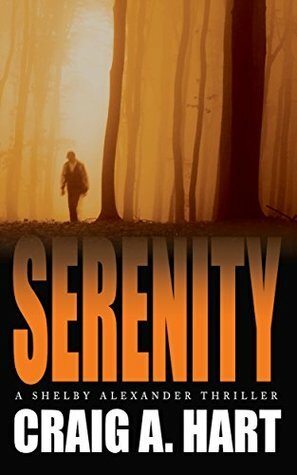 OVERALL, Serenity is an intriguing mystery that kept me glued to my seat. It had a thrilling progression and never bore me. I like it's points on family and I especially liked reading Shelby's life. However, what stopped me from giving it a higher rating is how short this novel actually is. I liked Shelby but I feel that there wasn't really so much time for me to really get into him.